I wanted to share with you a small project that I realized in my spare time. I put it as a free download, because there is already a lot of EQ and I really wanted to share it with a lot of people. The source files are in the "" Dev "" tab. If you have free time, I miss the vst / au for MacOs and for Linux. That's it, a little simple tools to try. The Color function is the first version of the tests I did for the impulse. It's pretty good but not as successful as in my current plugins (which I will sell). @alexaudio10 your dev files are not working I'm trying to compile them on mac, and is all crazy. First of all thank you for trying to compile it for MacOs, it's really very appreciate. What is it that does not work? But I just saw this on your website - *** You can not resell or redistribute the product. You may convey verbatim copies of the Program's source code as you receive it, in any medium,... You may charge any price or no price for each copy that you convey, and you may offer support or warranty protection for a fee. The build went perfectly on Linux Mint 19. I had to open the Archive (.hip) file as the .xml was empty. So is only the unbuilt version free??? 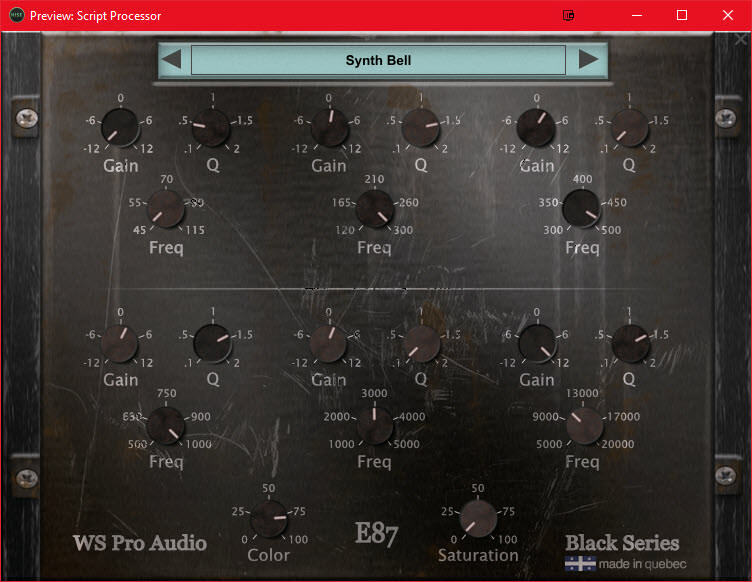 The downloaded vst says demo in the plugib title, and has very frequent sound dropouts. In fact, I had a hard time understanding the license. Christopher is asking us to share under GPL when it's free, but anyone can take back your software and resell it? I do not understand ! As for the sound that cuts, it's a bug. It's settling now. Just to download again (without forgetting to delete the old version. @alexaudio10 This is a common misunderstanding, I will try and clarify it. The GNU GPL is a copyleft license, that means any software you write that includes code released under the GPL must be released under the same license, unless the copyright holder gives you permission to release it under a different license. HISE is released under the GPL which means any projects you create with HISE must also be released under the GPL unless Christoph gives you permission to choose another license, for this he charges a fee. This is known as dual licensing. The word "free" is what causes the confusion. In English "free" can refer to two things, either zero cost (gratis) or freedom (libre). The GNU GPL is not concerned with price it is only concerned with freedom. So when you create "free software" that software must give the user the four freedoms that define "free software". You can read more about it here - https://www.gnu.org/philosophy/free-sw.en.html. Software that does not give the user the four freedoms but is available gratis should be referred to as freeware. If you want to use another license then you need to discuss this with Christoph. I don't think it's a good idea to share the Linux plugin yet because of the bug that causes the host to crash and you'll get users complaining. I'll need to do further testing to provide Christoph with the info to fix this. For linux, thank you for the information. I will wait! tested and working fine here in 64 bit (not tested the 32 bit). As i'm a fan of realistic GUI, not fan of this part of your plugin. as you gave the source i will maybe "customize" my personnal vst with "tired" metal brush aluminium background with rust on some parts. changing buttons. but keeping the rest. (for my personnal use of course). 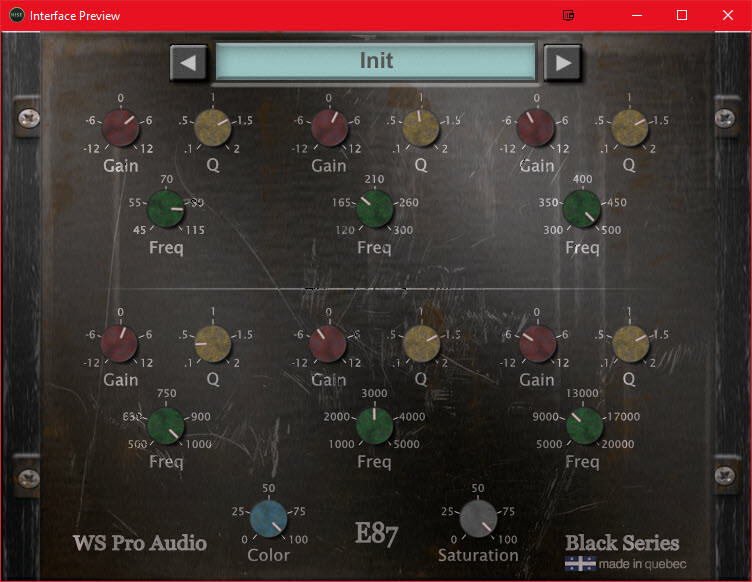 Your plugin feels like an old vintage British EQ. If you make changes, send me the file. I am curious to see! will do this on the weekend. Got it to work, will compile (au, vst, vst3 and standalone) on Mac and I'll send it to you. Wow! I like ! I would like if you want, when it will be finished, share it with my clients. I am sure he will love! I am going to add a LP / HP and release an update of some bugs. I could take it out at the same time. Contact me privately for details! with colored rusted fingerprinted knobs. first , or second ? third ? pretty close final version i want. preset selection arrows replaced by .png filmstrip buttons. Really not bad. I will look at what is possible to have a multi interface. It's going to be the best solution because now two plugin for the same on a free version is going to be too long. Do not forget to send it to me by email when it will be finished! Do you change anything other than the interface? Do you change the interface resolution? added the preset system inside hise (and not external .js) to be more flexible and modifying the arrows. deactivated the "demo" section (just uncommented and bypassed module). easy to reactivate. "made in Quebec" is now on the interface background image. Hise label deleted. But for the main functions, i've not modify anything. That's your work. your plugin.